Gina was a student of the piano from 5 years of age, an accomplished pianist by her early teens decided to add to her musical curriculum at the music college the accordion, having already achieved her teaching and performance diplomas on the piano, receiving the Chopin and Mozart Prizes in international competitions, then achieved British, Commonwealth and International titles with the classical accordion. Following this period, she turned professional formed a group, and together with brother John and husband Norman, has played all over the world, whilst working on board the QE2 for many years. Having by this time added vocals in six languages to their repertoire. Together they have played all major hotel groups, top nightspots, have had their own television series, have won the Television and Stage Awards, for the best vocal/instrumental group. 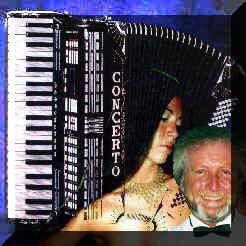 Gina was chosen as a Golden Master, adding her name to some of the worlds most famous accordionists, Gervasio Marcosignori, Pino di Modugno, Wolmer Betrami, and received a title which she proudly uses, in recognition of her always using her Italian name, and representing the Italian accordion industry, by performance and recognition as one of the most prolific female accordionists. Since receiving the award and title, she has appeared in Germany, Italy and with Norman as Romany Rye appeared in the USA many times over the past few years..
A tour of 16 concerts in 3 weeks in 3 states, playing to audiences in Accordion Clubs, theatres and in Cotati, San Francisco where the gate received over 16,500 people, it was an outstanding success, a tour of Texas was next with a superb Texas Welcome, a further tour in 2000 and 2001 have now been completed, San Francisco, Los Angeles, San Diego, Las Vegas, Madera, Stockton and back to San Francisco. The 2nd Las Vegas Convention was a complete success, and an introduction of a late hours club made use of even more hours in the day and night. Now it is the 3rd Las Vegas Convention. The year 2001 , Gina became an officer and a member of the Music Committee with The NATIONAL ACCORDION ORGANISATION OF THE UNITED KINGDOM, this year was the year for The United Kingdom to host the CIA World Championships and Gina assisted Chairman of the NAO, vice chairman of the CIA Mr Raymond Bodell to host the event. Gina Stage Managing, adjudicating and chairing the jury in the Piano Accordion Class and introducing the Concerts each evening as MC. The Event was a complete success. Gina has produced a web site for the NAO this year, also reported on the Events CIA Coupe Mondiale in Harrow, London, and the CMA Coupe Mondiale in Lorient, France. A cassette was produced for the tour of the states with 19 tracks of accordion favorites. A new CD for Las Vegas and Cotati containing lots of original music and songs written by Gina. BBK PRESENTS AN ON LINE ACCORDION MAGAZINE, WITH ALL THE INFORMATION FOR YOU TO DOWNLOAD FREE, AND APPEALS FOR YOUR CONTRIBUTION TO THIS ONLINE EDITORIAL.